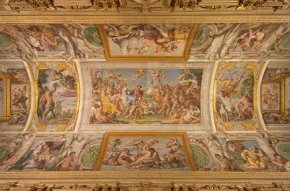 13/5/11 – Restoration – Rome, Palazzo Farnese – In 1994, the mural paintings in the Carracci Gallery at the Palazzo Farnese (ill.), a masterpiece of Western art, had undergone minor restoration in order to consolidate the ceiling. The work, however, had not been completed due to lack of funds as well as the complexity of the task. When restoring such an important ensemble, great care should be taken to ensure that overall harmony of the painting be preserved. Although the paintings themselves do not seem to be in poor condition, they do require a cleaning which should begin soon, perhaps even this summer, thanks to generous contributions from patrons. The Italian government will provide 200.000 euros with the rest being funded by the Fondation de l’Orangerie pour la Philanthropie Individuelle  (400.000) and by the World Monument Fund which will complete the operation with a contribution of 400.000 or 500.000 euros. The estimated cost for the entire project is about one million euros and the restoration should take one year. The participation of the World Monument Fund, an institution which is particularly aware of the difficulties and risks which could arise during this type of operation on such a prestigious work, is undoubtedly a guarantee of the final success. During the press conference, the French ambassador to Rome, Jean-Marc de La Sablière, did not provide too many details about the conditions surrounding the restoration . The Embassy is running the project but we were not able to find out, in a precise way, who will be in charge. A scientific committee will be set up to supervise the work but it has not yet been selected. We would like to point out that the ambassador stated that once the restoration is finished, the Palazzo Farnese will be open to the public more often than it is now. We would even go so far as to qualify this as a historic decision (see our editorial of 1/2/05 in French). Didier Rykner, Thursday 12 May 2011 Notes 1. 2. This foundation, created in 2007 by BNP Paribas Wealth Management, accepts donations from clients at this private bank which it then uses for patronage support.